Engagement and interaction from your followers are all that matter. Snapchat has higher engagement than any social network on the planet right now. My rule of thumb when it comes to being authentic is: If you don't feel self-conscious and want to reshoot the video after publishing it, you're probably not being authentic enough. Technology has changed everything. Our marketing efforts need to evolve and keep up, or eventually, we'll find ourselves irrelevant and out of business. Sound impossible? It’s not. That’s exactly the kind of engagement you can find on Snapchat right now. Imagine: 80 percent to 90 percent of your Facebook friends commenting, liking and sharing your posts. You see, engagement is everything. It doesn’t matter that you have 100,000 likes on your Facebook business page if only two or three of them ever like or comment on your posts. Engagement and interaction are the goals; engagement and interaction are essential. The ground is shifting underneath our feet, and most of us won’t realize it until it’s too late. How many people do you know who are just barely starting to use Facebook? The only reason they are is because they don’t want to be the last one in the water. As Realtors, we can choose to either embrace technology and social media, or we can put up our dukes and resist — at least for a little while. For those of you who resisted joining Facebook, how did that work out for you? Because snaps disappear after they’re viewed, you’ll have your followers’ undivided attention. They won’t be scrolling through a news feed at hyper speed because there is no news feed. It’s all about attention — keeping the attention of those we want to see our message. This is exactly why I’m jumping on Snapchat to market my real estate business in 2016 and why you need to do the same. We live in an on-demand world — a world in which many of get legitimately upset when another human being calls us. Be honest: You, too, have been irritated by a phone call at a time that was inconvenient for you. Why do we now prefer texts to phone calls? Because a text can be read and responded to when it’s convenient for us. Netflix put Blockbuster out of business because it gave consumers the ability to watch what we want when we want to. Same thing with Uber disrupting the taxicab industry. We want everything on demand. Snapchat allows our followers to open our snaps when they want to see them. With Snapchat, you can keep someone’s full attention when they are ready to give it. Where else in our society can you do that? Real estate is very visual. Videos and photos are everything, and that’s exactly what Snapchat is all about. I like to record snap videos when I’m previewing a home. If the home for sale has a great view of the Salt Lake Valley, I snap it, sometimes with a little narration. The viewer of the snap will get a feel for how the view looks in person. They can then message me within Snapchat and request more info about that particular home. Do any of your listings have unique aspects that you want people to see? Record some snaps that show them off. These are much more effective than a few eloquent words buried in your MLS description. Do any of your listings have unique aspects? Record some snaps. The other night on Snapchat, I showed off some new smart home technology at Home Depot. My followers saw some cool new smart home gadgets, learned how they work, and now, they know to watch my snaps if they want to hear more about smart home technology — not just real estate. I add these snaps to My Story, viewed as one long string of photos and videos, which allows me to create a few minutes of valuable content for my followers. A “story” collects all your snaps together in one place and is visible to all your followers and friends for 24 hours. Is anyone already using Snapchat to advertise? Additionally, some major brands including CNN, Comedy Central, ESPN, Mashable and National Geographic are part of Snapchat Discover, where these brands highlight exclusive Snapchat video content and articles and then direct viewers back to their websites. During the 2016 College Football Playoffs in January, Dr. Pepper went all-in on Snapchat and created an account for Larry Culpepper, their hilarious (or annoying) stadium soda concessionaire who claimed that he invented the college football playoffs, so naturally he should be allowed to present the National Championship trophy. Those who followed Larry’s Snapchat story were entertained with more hilarious content above and beyond what we all saw in the commercials. In January 2016, The White House jumped on Snapchat as well, allowing followers to see all sorts of behind-the-scenes stuff from the White House. If this alone doesn’t convince you that Snapchat is a very, very big deal, then I don’t know what will. Are movie studios, major food companies, and The White House just wasting their time and money marketing on Snapchat? I seriously doubt it. I believe they just see where the world is moving and are getting in ahead of the wave. Simple — YouTube it. There are countless how to use Snapchat videos on YouTube to teach you how Snapchat works. Set aside 20-30 minutes, download the app and start playing around with it. It’s very different from any other social network, so if it doesn’t make sense after the first day, that’s OK. It took me weeks before I got the hang of it. Just keep playing around with it, follow some people, watch their stories and see how it’s done. Learning to tell stories on Snapchat is key, so follow marketing influencers who are already doing it successfully and follow their lead. Take social media and marketing genius Gary Vaynerchuk as an example. If I had to choose just one marketing or business expert to follow on Snapchat, it’s him. (username: garyvee) Watch how he uses Snapchat and follow his lead. Gary is a real Snapchat master. 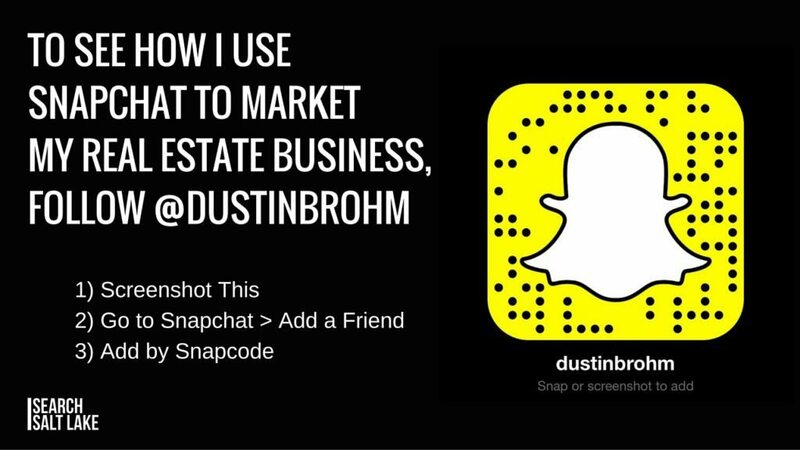 Learn how I’m using Snapchat for real estate as well. 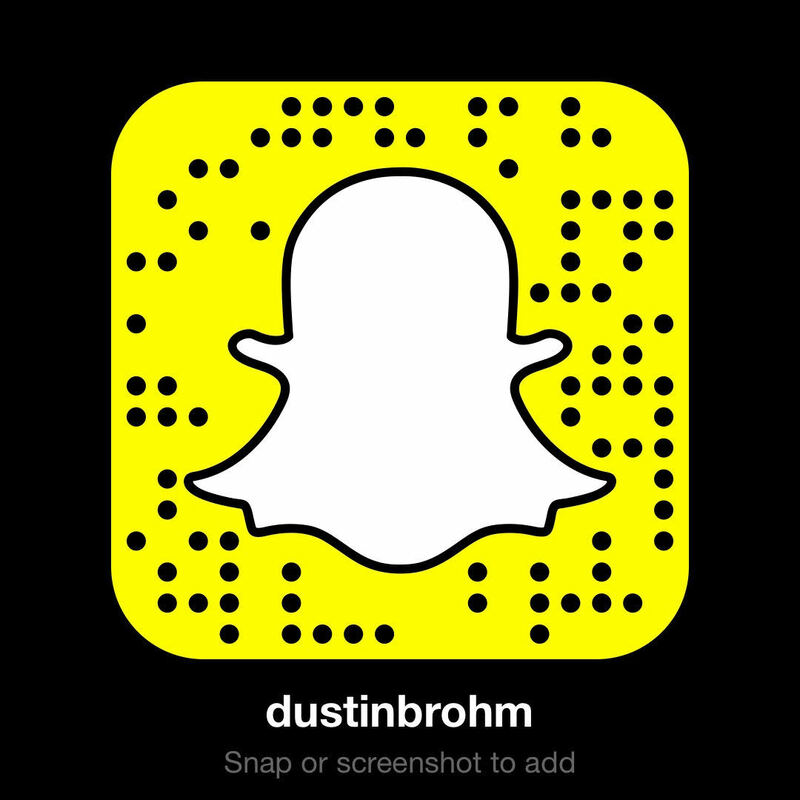 You can either type in my username: dustinbrohm or take a screenshot of my Snapcode. You’ll see how I use Snapchat to tell stories and educate people about real estate and smart home technology, as well as to highlight unique homes for sale in the Salt Lake City area. Even more valuable than snapping your listings, Snapchat lets me being myself — authentic, unrehearsed and real. These days most people are turned off by the polished, rehearsed salesperson giving a sales pitch on why they’re the best agent for the job. They want to work with someone authentic and real, but who has also given them value and educated them. Someone they view as an expert. Although Snapchat is a perfect way to get in front of a younger group of potential clients, don’t think you’re going to start getting business after a week. Set your expectations for the long term. It’s all about engagement with your followers, creating relationships and showing that you’re an expert in your field by consistently providing valuable and entertaining content. Snapchat is just a tool in your marketing toolbelt, but success won’t happen overnight. It takes time to grow a following on Snapchat and then to direct those followers back to your website and other social media channels. It’s important that you commit to at least six months of regular, consistent snapping. Just like any other form of real estate marketing, it takes time and consistency to see results. But that doesn’t mean it can’t be fun. It all comes down to a simple decision: Will you decide to download Snapchat and learn how to use it? Or will you resist it for the next two or three years and make excuses like “Snapchat is just a fad”? Dustin Brohm is a Realtor and Founder of SearchSaltLake.com. Connect with him on Facebook and Google Plus.